The Bent Bar Corner Bracket consists of a 2″ pipe and a 3/4″ square solid bent bar with 2 pre-greased setscrews. One pre-greased setscrew of a 1/2″ diameter, by 1″ long is for locking the 1-1/2″ non-floating end of the framework pipe to the previous walkway at right angles. The second pre-greased setscrew is 1/2″ diameter by 1-1/4″ long and is inserted into the threaded hole in the square bent bar to attach the corner bracket to the 2″ dock bracket sleeve. 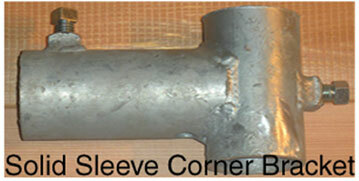 If the Bent Bar Corner Bracket is used on the 1-1/2″ framework pipe a longer set screw is recommended. Each right angle (90-degree) turn in a dock will require a minimum of one Bent Bar Corner Bracket. It weighs 2.5 lbs. The Solid Sleeve Corner Bracket consists of a 2″ pipe and has two pre-greased setscrews 1/2″ diameter by 1″ long and is used for locking the 1-1/2″ framework pipe from the main walkway to the L segment (platform, sundeck or super sundeck) at 90 degrees. The Solid Sleeve Corner Bracket is designed to be used as the middle corner bracket under the 5′ wide platform, one of the corner brackets under the 10′ wide super sundeck, or for the walkway parallel to shore for a slip addition to the left or right of the main walkway. It weighs 3 lbs. 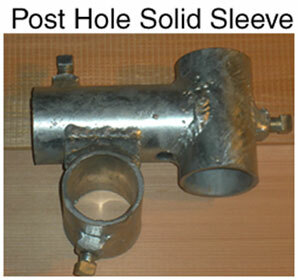 The Post Hole Solid Sleeve Corner Bracket consists of 2″ pipe and has three pre-greased set screws 1/2″ diameter, by 1″ long, used for locking the 1-1/2″ framework pipe, from the main walkway, to the L segment at 90 degrees. There is also a third sleeve for an additional vertical pipe situated in the inside corner post for the boat house standard to attach to or for an open slip fourth corner boat mooring line to tie up to. Along with an inside corner of the L segment, for one end of a bench bracket to connect to. Another use is the Post Hole Corner Bracket for an inside corner of an L segment for the the 3’6″ wide sectional, 5′ wide platform, 7′ wide sundeck and the 10′ wide super sundeck. The inside corner bracket can also be used on the crossover walkway (parallel to shore) for additional finger to complete slip. Another use is, for the Post Hole Solid Sleeve Corner Bracket vertical pipe sleeve for tying the fourth corner morning line. Used to tie the boat properly, with the boat staying clear from contact with the dock. The Post Hole Corner Bracket weighs 4 lbs. The C-Channel Corner Bracket consists of 2″ pipe and a C-shape saddle. The C-Channel Corner Bracket has 2 pre-greased setscrews for locking the C-Channel Corner Bracket support saddle to the desired location and level, parallel with the water. 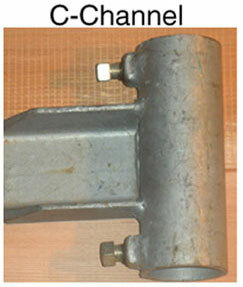 The C-Channel itself rests inside the C-Channel Corner Bracket saddle and is not bolted down. However, an optional bracket can be added upon request for those that may have excessively high waves from strong winds that may cause the C-Channel to pop out of the C-Channel Corner Bracket saddle. The C-Channel Corner optional bracket itself is called the “C-Channel slide locking mechanism”. The C-Channel Corner Bracket weighs 4 lbs.